Santiago Calatrava is a renowned architect, structural engineer and artist. Recent projects such as the Athens 2004 Olympic sports complex, the Turning Torso in Malmo, and TGV station in Liège, have brought him international acclaim. The only architect to exhibit at both the Museum of Modern Art and the Metropolitan Museum of Art in New York, he is presently designing the main transportation hub for Ground Zero in Manhattan, as well as the tallest building in the USA: the 150-story Chicago Tower. 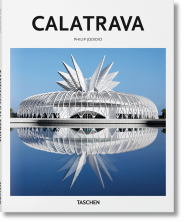 Calatrava collaborated extensively on this monograph, which traces his career and places his architecture in the context of his art and engineering prowess. All of his works, from the suspended swimming pool at Zurich’s Federal Institute of Technology to his latest, startling designs, are featured in this lavishly illustrated volume. 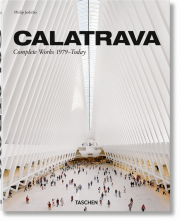 This updated, compact version of the XL edition includes new projects such as the LRT Bridge in Jerusalem, and new photographs of recent Calatrava projects including the Fourth Bridge over the Canal Grande in Venice. Santiago Calatrava (born in 1951) studied art and architecture at the ETSA of Valencia and engineering at the ETH in Zürich. His best-known works include the Milwaukee Art Museum, the Opera House in his native Valencia, and the Turning Torso in Malmö, Sweden. Calatrava has received the American Institute of Architects (AIA) 2005 Gold Medal. He is based in New York and Zürich. "TASCHEN's new tome on the Spanish-born architect contains the designer's complete works, from his sinewed bridges to his audacious high-rises. And while some of his boldest projects - the Chicago Spire and New York City's 80 South Street - succumb to the global real estate crisis, the book faithfully represents the artist's full body of work. Experimental sketches recalling Auguste Rodin complement gorgeous photographic spreads and renderings."